What are “LAKE ARROWHEAD LAKE RIGHTS” – All properties located within the boundary of Lake Arrowhead (except Lakewood A & B) have lake rights. This means the home owners have the right to use the Lake for recreational purposes, i.e., boating, fishing, swimming and using the reserve strip for foot travel where designated. Lake Rights also means that the homeowner may own a boat dock on Lake Arrowhead, California. This membership entitles you to all of the amenities of a General Member PLUS access to the Burnt Mill and Tavern Bay Beach Clubs. You will receive two (2) membership cards. Each card allows access for one (1) member plus five (5) guests per card for a total of six (6) people per card, including children. This membership is for dock and slip right owners. This membership must be renewed yearly. A Dock/Slip Right Membership entitles you to all of the amenities of the Beach Club Membership and the General Membership. There are over 2,500 docks on Lake Arrowhead. Of those 2,500, 75 are convenience dock slips available to all boaters and the rest are privately owned. Owning a dock on Lake Arrowhead is a unique opportunity. It can be a place to relax and have fun and it makes hopping in and out of your boat for a day of fun in the sun a lot easier. But dock ownership is also a responsibility. All dock owners agree to keep their docks and all improvements on ALA property maintained and in good repair. Where is ALA property? The entire shoreline around Lake Arrowhead is owned by ALA. No residential parcel touches the water. If you would like to make improvements to your dock area or just need to do some maintenance, you will need to have a Permit. Expedited Permits are for work that is under $2,500.00 and are free to obtain. Other permits have fees based on the type of work you are doing (see Fee Schedule). No matter what the work is, if you need a contractor to perform the work you must use an ALA Registered Contractor. Your contractor will be working on ALA property and only ALA Registered Contractors are allowed to work on ALA property. Review the information on this page and the related links to ensure that all improvements are done properly. Rainbow Trout are planted in the lake annually. Some of these are tagged. If you catch a fish with a tag, please give us a call and let us know the size and location of the catch. This informatin helps us in our fish stocking efforts. State fishing regulations do apply and state fishing licenses are required. 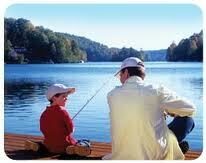 For more information about fishing at Lake Arrowhead. Click here for rules, regulations and licensing. Lake Arrowhead membership dues are subject to change. Contact Arrowhead Lake Association for updated fees.